a new collection is being launched next week. I ABSOLUTELY LOVE the new collection and I know you will, too! Today's card is simply to create but oh so sparkly. It's covered in gorgeous Lion's Mane glitter! Create a 6” x 6” card base from Kraft Cardstock, a 5 7/8” x 5 7/8” orange mat and a 5 3/4” x 5 34” scene from the paper pad. Ink all of the edges with Vintage Photo ink. Adhere the scene to the orange mat with dries clear glue and adhere to the card base with dimensional tape. Glitter all the leaves and flower’s with Lion’s Mane Glitter. Stamp the Sunflowers from the Sunflower Accents Cling Stamp set with Tuxedo Black ink on white cardstock, and color with Bamboo Leaves, Peanut Brittle and Rhubarb Stalk inks and cut out with matching dies. Shape with the Deluxe Flower Shaping Kit, add mini beads to the flower centers and adhere to the card using hot glue gun. Make a triple loop bow, add to the card base as shown and top with a sunflower. 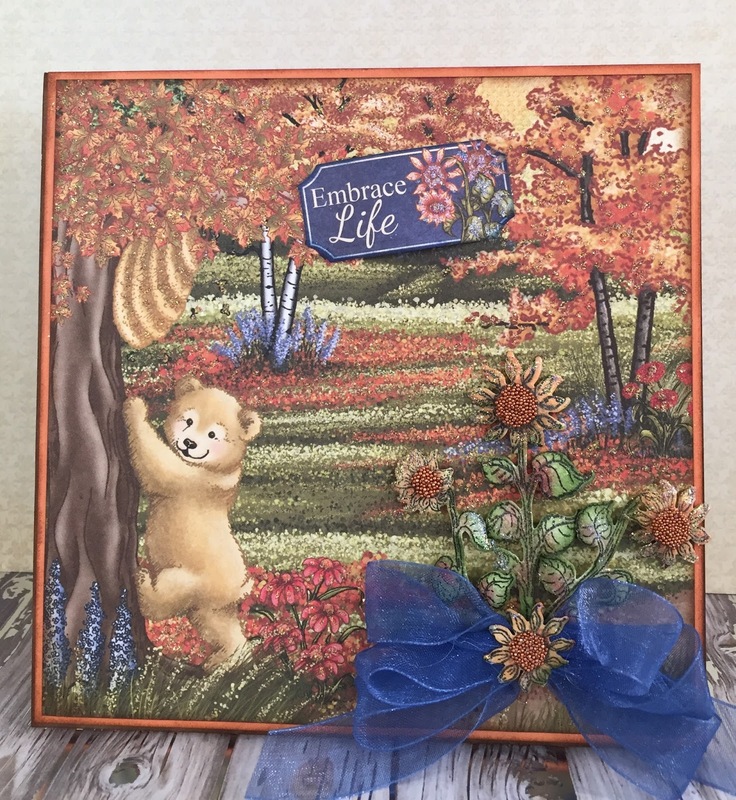 Cut the Embrace Life tag from the paper pack with the Luggage and Tags die, ink the edges with Danube Blue ink, add glitter and adhere to the card. Cut a piece of paper 5 7/8” x 5 7/8” from the paper pad, ink the edges with Vintage Photo and adhere to the inside of the card. Your comments make my day so please take the time to leave one. This is just so beautiful! I love the flower centers! I just had to comment on this because your card is beautiful, BUT these dies are not available to the general public.....everyone cant find chonodra (spelling ) or even order from them, why does heartfelt continue to throw this set of stamps out to the public when its not available to the public yet!!! and may never be!!! I find it insulting since I bought the whole set except for this set which was not available!!!!!! believe me I have complained to them also for this!!! That climbing bear is just so adorable!! I love love love the blue net bow too! Beautiful card Janet!